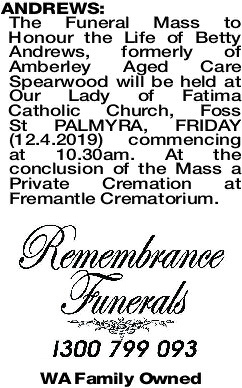 The Funeral Mass to Honour the Life of Betty Andrews, formerly of Amberley Aged Care Spearwood will be held at Our Lady of Fatima Catholic Church, Foss St PALMYRA, FRIDAY (12.4.2019) commencing at 10.30am. At the conclusion of the Mass a Private Cremation at Fremantle Crematorium. 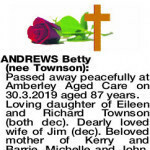 Passed away peacefully at Amberley Aged Care on 30.3.2019 aged 87 years. Loving daughter of Eileen and Richard Townson (both dec). Dearly loved wife of Jim (dec). 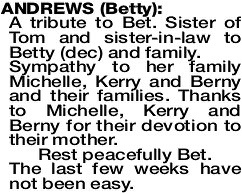 Beloved mother of Kerry and Barrie, Michelle and John, Bernie and Bev. 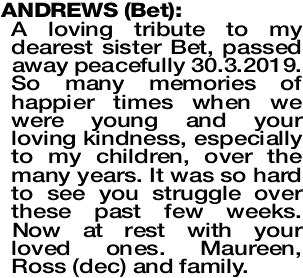 Devoted and loving Nanna of nine grandchildren and great Nanna Bet of eight. You loved us all unconditionally and lived your life for your family. Treasured memories of a mother who showed love, kindness and selflessness for her family. We were so blessed to have had you as our Mum and friend. Now reunited with Dad on the dance floor in heaven. Our heartfelt Thanks to the staff at Amberley Aged Care for their care, friendship and devotion to Mum...she always had a smile for each one of you. 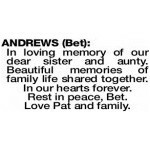 In loving memory of our dear sister and aunty. Beautiful memories of family life shared together. In our hearts forever. 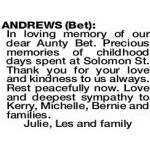 Rest in peace, Bet. Love Pat and family. 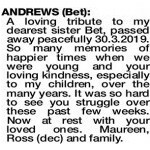 A loving tribute to my dearest sister Bet, passed away peacefully 30.3.2019. So many memories of happier times when we were young and your loving kindness, especially to my children, over the many years. It was so hard to see you struggle over these past few weeks. Now at rest with your loved ones. Maureen, Ross (dec) and family. A tribute to Bet. 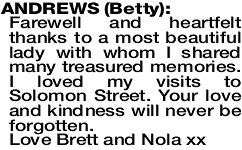 Sister of Tom and sister-in-law to Betty (dec) and family. 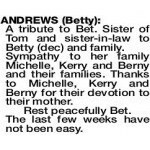 Sympathy to her family Michelle, Kerry and Berny and their families. Thanks to Michelle, Kerry and Berny for their devotion to their mother. 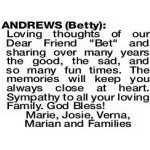 Rest peacefully Bet. The last few weeks have not been easy. 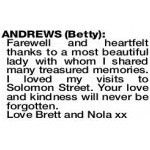 ANDREWS BETTY Farewell and heartfelt thanks to a most beautiful lady with whom I shared many treasured memories. I loved my visits to Solomon Street. Your love and kindness will never be forgotten. 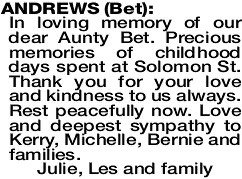 ANDREWS BET In loving memory of our dear Aunty Bet. Precious memories of childhood days spent at Solomon St. Thank you for your love and kindness to us always. Rest peacefully now. Love and deepest sympathy to Kerry, Michelle, Bernie and families. 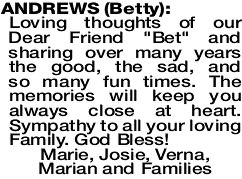 ANDREWS BETTY Loving thoughts of our Dear Friend "Bet" and sharing over many years the good, the sad, and so many fun times. The memories will keep you always close at heart. Sympathy to all your loving Family. God Bless!